There are a couple of things that one should always carry when leaving for a hike, or other activities in nature. Two things are important to be said right in the beginning: No, this doesn’t mean that you need to walk with a huge, heavy backpack. And: No, owning these things is not expensive, nor exaggerated. The list is of course not an invention by myself but recommended by hiking organizations, the scouts and featured in books, like ‘ Mountaineering- the freedom of the hills’. It doesn’t matter if you are going for a weekend camping trip, a day hike in the mountains, a tour in your kayak or on your mountainbike- as soon as you are away from the town, the road, from other people and possibly also from phone coverage you should carry some extra material. The reason for this is not some kind of over-dramatized survival scenario or fear of something very improbable happening, it’s simply a way to ensure you are comfy and safe, even if things go different than planned. A hike can take a bit longer than expected. The weather might change and suddenly it starts raining, or the sun might burn down on you from the sky. You might be unsure about which trail was the one you were supposed to choose on a way crossing. Your hiking buddy maybe stepped on their shoelaces and they ripped off. The way down the mountain after your climbing afternoon can take some more time cause you are stiff and tired. 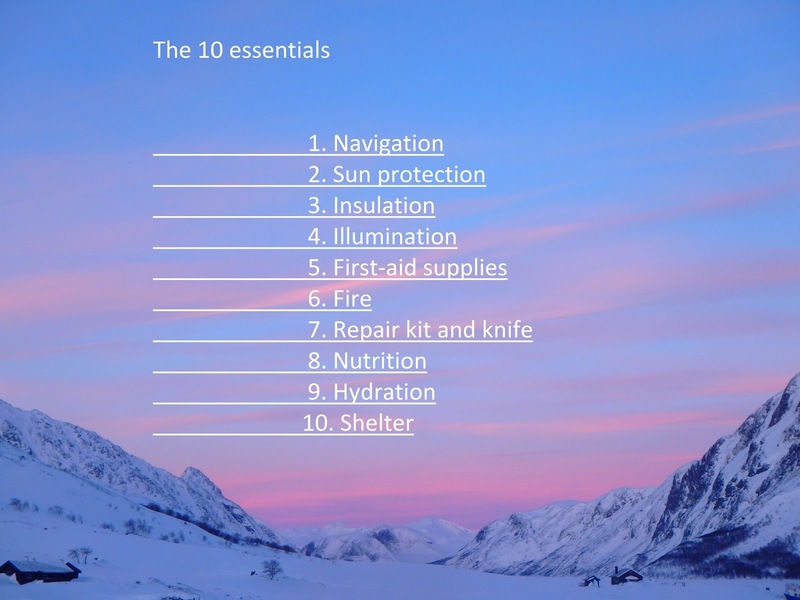 Having the 10 essentials is of advantage in any of those cases and prevents you starting to feel uncomfortable or potentially even getting in danger. And even without unforeseen events you should carry these things. Taking care of your basic physical needs like drinking, eating, being warm, not being blinded by the sun or getting a sunburn are fundamental for enjoying your day out in nature. Bringing a map and compass and/or a GPS, or even your smartphone with offline topographic maps, is not an option but a must. Don’t be selfish and rely on your phone to call for help in case you get lost. And this point is valid not just referring to navigation but to all the gear you should bring with you, in order to ensure your own well-being. If you need to call mountain rescue because you failed to bring gloves in cold conditions and can’t feel your fingers anymore, you are wasting the emergency services’ time (and a lot of money). This might sound far-fetched, but there are plenty of accidents and incidents in the mountains every year (in basically any country you get statistics for) and a big number of those are caused by poor navigation, lacking material and inexperience in how to use the carried material. If we take a look at Spain, a country with plenty of mountaineous regions and many tourists, the statistics talk about around 800 rescues a year, executed by the GREIM (Grupo de Rescate e Intervención en Montaña) which is part of the Guardia Civil, a military force. Of those rescued, more than 50% are injured and more than 10% die, or are encountered already dead. 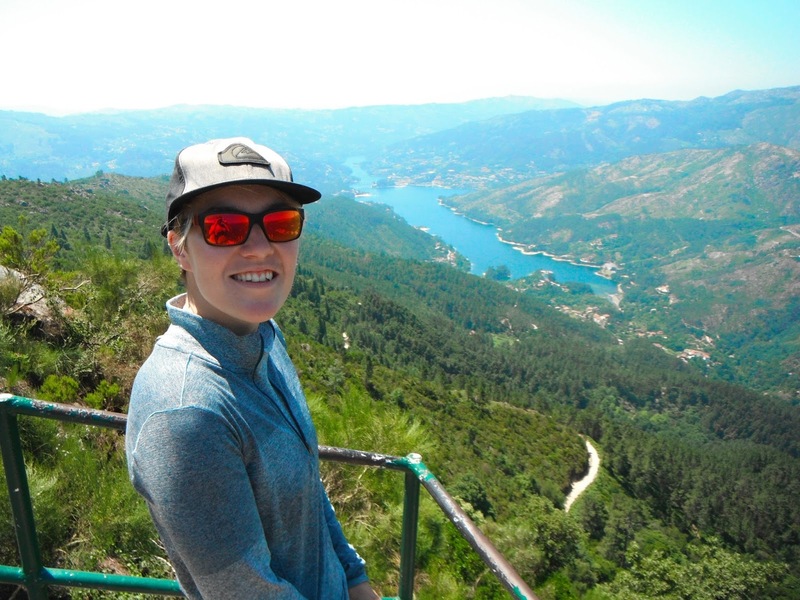 You might think that it’s mostly the more ‘extreme’ activities that are risk filled and that a simple hike is rather safe, but in reality it’s contrary. In Scotland, for instance, 77% of all casualties in the mountains between 1996 and 2005 happened while hiking. Compared to Spain there is a lower number of fatalaties though, with an average of 26 per year. 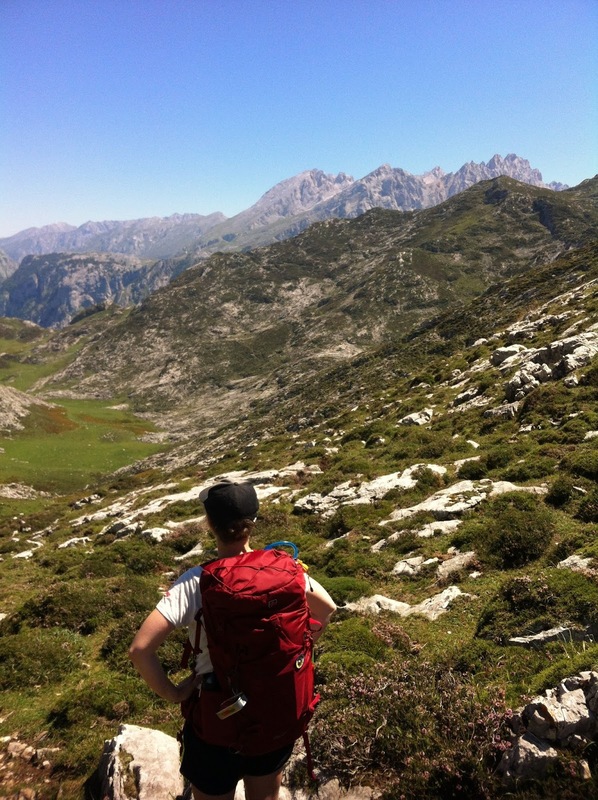 The same picture can be seen in the Alps, with Austria as an example, where over 80% of all fatalities happen during ‘hiking in easy terrain’. In 2013 those where 162 persons, in 2014 156 persons. In comparison: only 6 persons died during ice climbing and glacier tours in those two years put together. I do believe that these numbers do show that a lot of hikers do understimate their hobby and do not equip and prepare themselves sufficiently. These numbers are not ment to scare anyone away from going to the mountains, it just shows the importance of realizing that is is literally not ‘a walk in the park’. 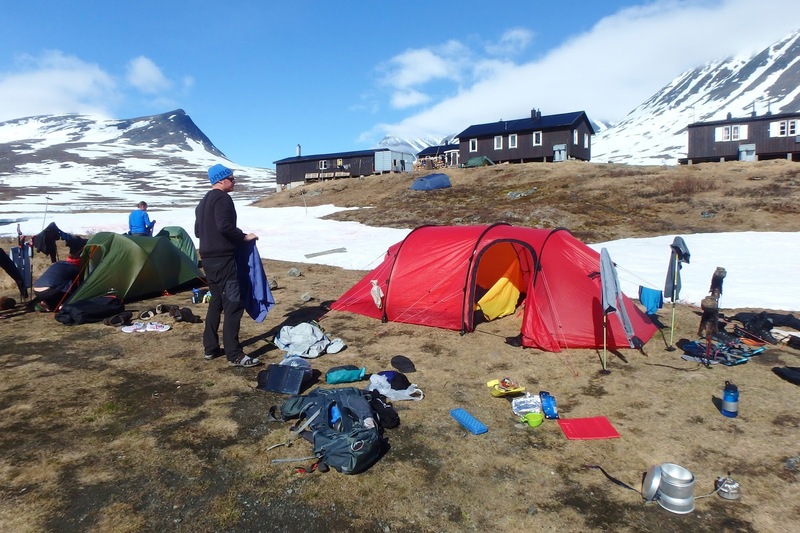 In the end, safety in the mountains is an equation with many variables, such as weather, clothing, preperation and planning, experience and the activity you are doing. Bringing the gear to keep you safe can not prevent all possible problems, but it’s part of what you can contribute and what’s inside your control. 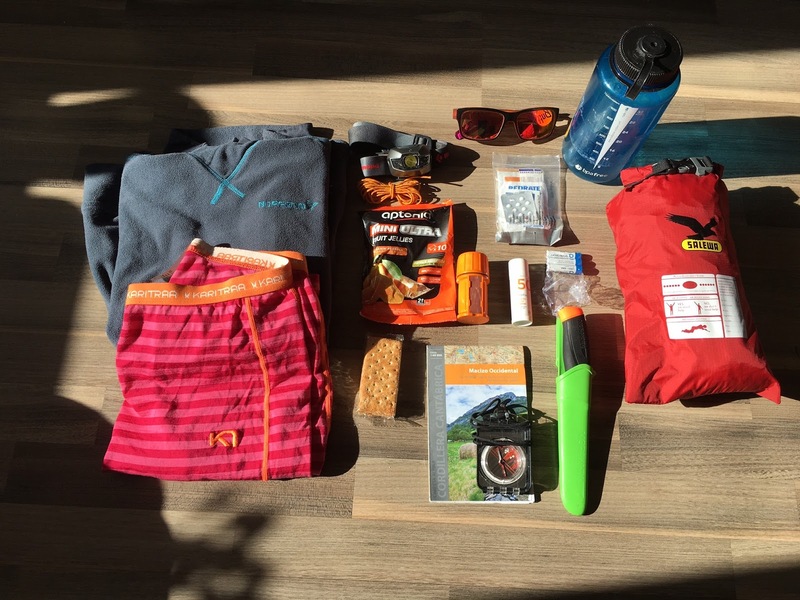 This is what I would bring for a longer dayhike in the mountains, in summer. Not including my normal food for the day and the water in the bottle, it’s all together only around 1,5 kg. Not too much to carry on your back, even if you are conscious about the weight you want to carry. Besides that, there are plenty of ways of making this setup even much lighter. 1. Navigation– it is good to have an idea about where you are going; not only as a picture in your head, but a bit more reliable. It’s not only about avoiding getting lost, but as well about finding an alternative way, in case you want to make a short cut or change your plans. The optimum is a map with anything between 1:20.000 to 1:100.000 as a scale to reality. 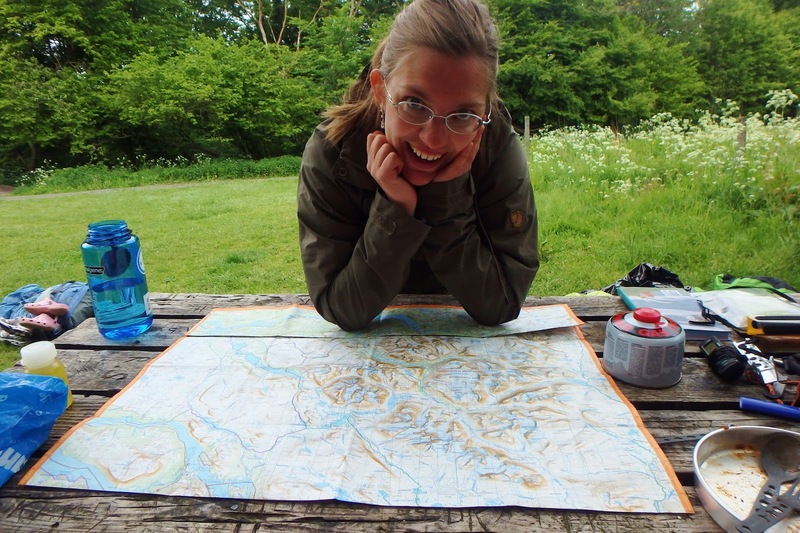 It’s not enough to just own a map, you should also stadily have a look at it and not wait till you are actually lost to get it out of your pack. It’s even fun to look at it, see what are the names of mountains or lakes you walk past and see what’s behind that forest you are walking through. The same is valid for your compass. Use it and get used to it and you might never even come in the situation where you are seriously lost. Personally, I use my phone for navigation quite a lot. I draw trails into maps at home and upload them to wikiloc.com. I have offline maps for all places I go hiking in and track myself with the phone’s GPS. I really do trust that system, but still I try to not walk around looking at the trail on the phone and rather search for the next trail marker ahead of me. Technology is really useful, but as opposed to a phone a paper map will never run out of battery. 2. Sun Protection– This one should be quite obvious. As nice as it is to get a tan, the sun can be destructive and it’s wiese to protect your eyes, your skin and your head. Dark lenses are especially important when walking or skiing on snow. Becoming snow blind is painful and annoying. Me, using textbook sun protection and a sunproof shirt on a 35ºC portuguese summer afternoon. 3. Insulation– It’s easy to get warm and sweaty while excercising. When you take a break it’s always a good idea to have an extra layer of clothing at hand, especially when it’s windy or overall cold. 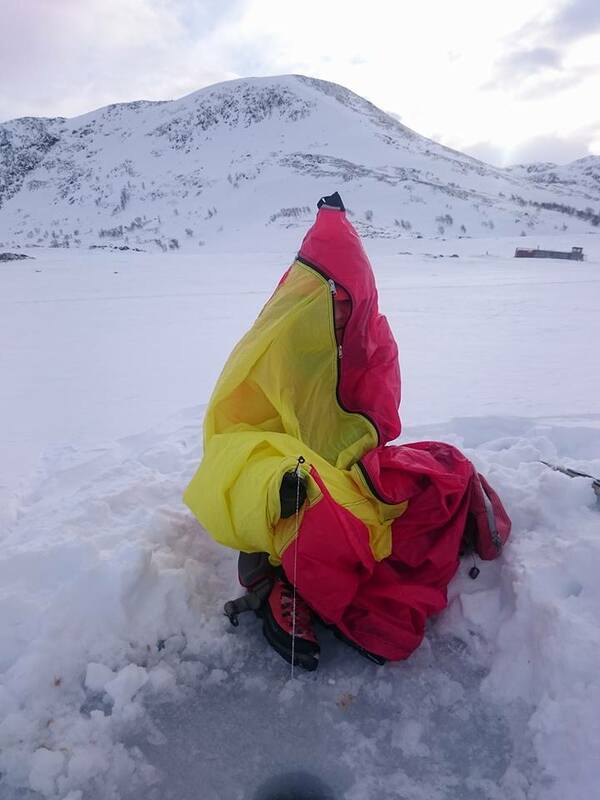 Even in temperatures around -10ºC I can still comfortably walk uphill in only a fleece, but once I take a rest, putting on my down jacket is mandatory. Even on the warmest days I bring an extra sweater in my pack (and yes, there’s an empty can of tuna dangeling from my backpack). 4. Illumination– As I mentioned before you need to adapt the light sources you bring to when and where you are going. 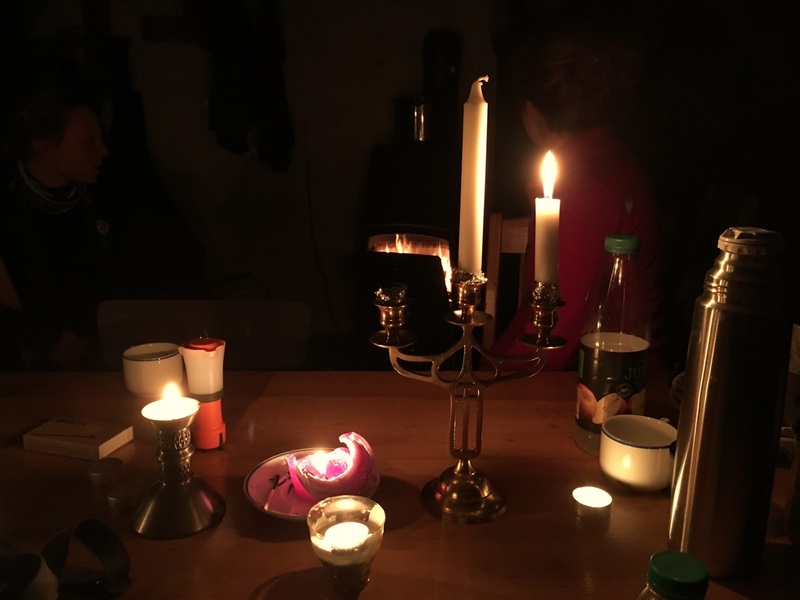 In wintertime in Sweden I bring plenty of candles, extra batteries for my headlamp and even another light I can put on the table. That way I try to adapt to the 16 hours+ of darkness, which need to be spend one way or another. In summer I don’t bring any light source at all, or just a tiny headlamp to use inside huts that have at times very few windows. Getting light into a hut in Norway. 5. First-Aid supplies– In your first aid bag you should have medicine you are familiar with and other supplies that you will probably use. There is no need in buying a first-aid kit at a gas station and bringing surgical scissors and other stuff you don’t even know how to use, on your hike. Make your own kit instead. Fill it with pain killers you know work on you, pills against diarrhea, maybe antihistamines, tape, band-aids and blister band-aids. Think what you would want to use to take care of a wound and get it at a farmacy. Bring something to clean sores and a tiny tube of cortisone or antibiotical cream. In the end, what you should bring, depends mostly on your destination. 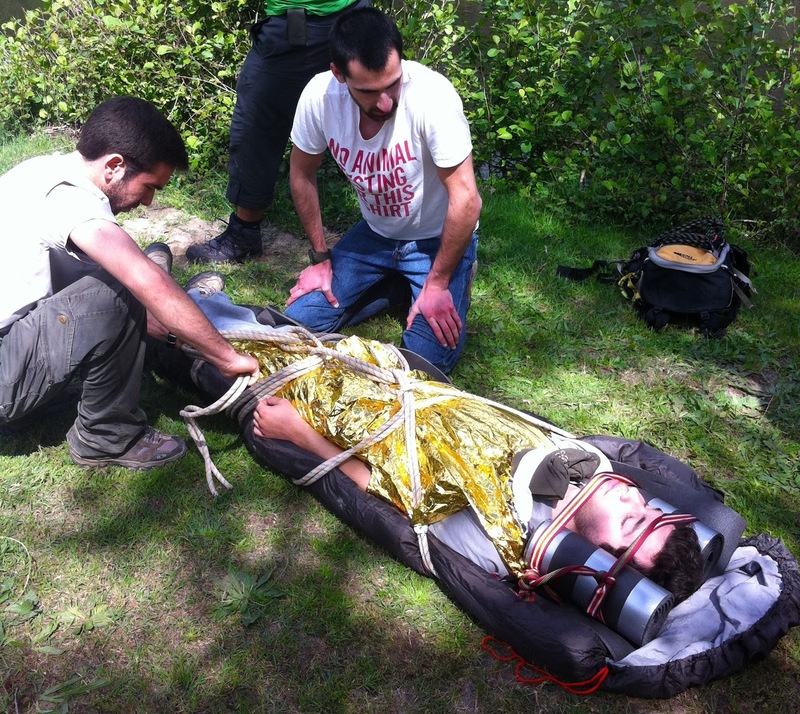 Participating in a wilderness First-aid course is a good way to learn about dealing with injuries and accidents. It’s also fun to wrap up one of your friends like this. 6. Fire– The least you can bring in order to make a fire, are of course matches or a lighter. If you even plan on making a camp fire, a knife to make feather sticks and tinder ist very helpful. In an emergency situation there are countless objects that can help you make a warming fire. From tampons, to batteries, wet toiletpaper or potato chips. You might have more burnable or easily inflammable things with you, than you might think. My first try on making fire with steel wool and a phone battery- it worked! 7. Repair kit and knife– This, again, depends a lot on your activities and where you are going. I always bring a knife, which I even use to prepare food. Usually it’s my Mora knife, which is useful and cheap. besides that I have duct tape, which I wrap around my water bottle, so I don’t have to bring a whole roll of it. It’s awesome for repairs of all kind. Some thin rope and a sewing kit is also always a good idea on a longer trip and has hardly any weight. Can you discover the duct tape bottle amonst all our stuff? 8. Nutrition– Food should not be underestimated when it comes to lifting you mood. 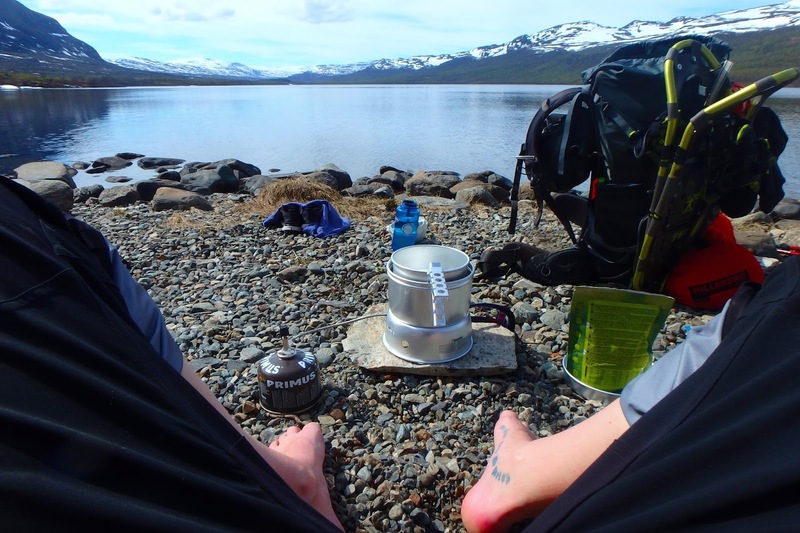 I always bring at least a müsli bar or some crackers on a trail. For longer trips I usually pack for one day more than I plan being out there. That way I’m more flexible and I don’t have to spend a day on an unvoluntary diet if I get stuck in bad weather and have to spend an extra night somewhere. Food for a whole day, including 3 meals and snacks, doesn’t have to weigh more than 500gr, dehydrated food is the key to going light. Eating outdoors can be a real pleasure. Taking in the view and waiting for the water to boil. 9. Hydration– I go by a simple rule: I bring a bit more to drink than I plan on needing. Going thirsty and looking for a water source is no fun at all… When you’re in the cold try to melt snow instead of eating it, you will lose a lot of body heat and energy that way. Try to be informed if water is good to drink, or if having a filter, or other means to clean your water, are necessary. I usually have some Catadyn micropur pills in my first aid kit, which I use whenever I’m in doubt. 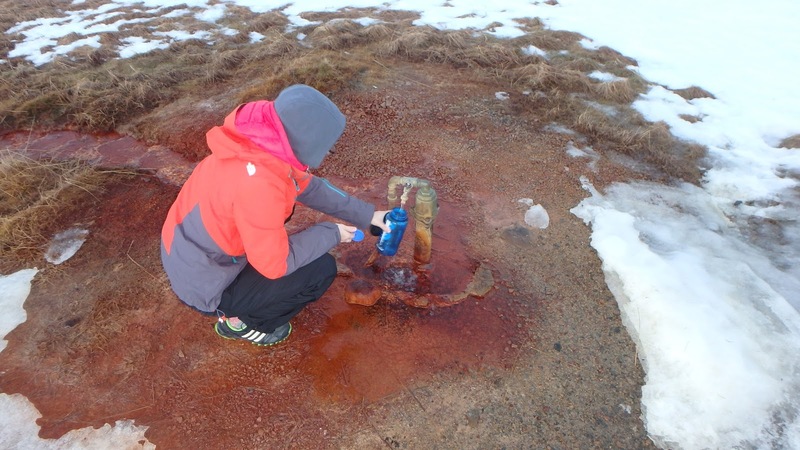 The colour of this source in Iceland was not promising… It’s supposed to be a water especially good for your health though. Cheers! 10. Shelter– A shelter can be anything between a feather light space blanket, that fits in your pocket, or your tent. Finding shelter from wind and rain doesn’t have to imply an emergency, but is a simple commodity to have a moment of rest, look on your map or have a quick snack. Looks like I’m member of a weird cult, but I’m actually just trying to ice fish without freezing myself into pieces. Here I’m sitting in a windsack from Hilleberg, which can be used as a bivaque bag for up to 3 persons, or just as a wind protection. 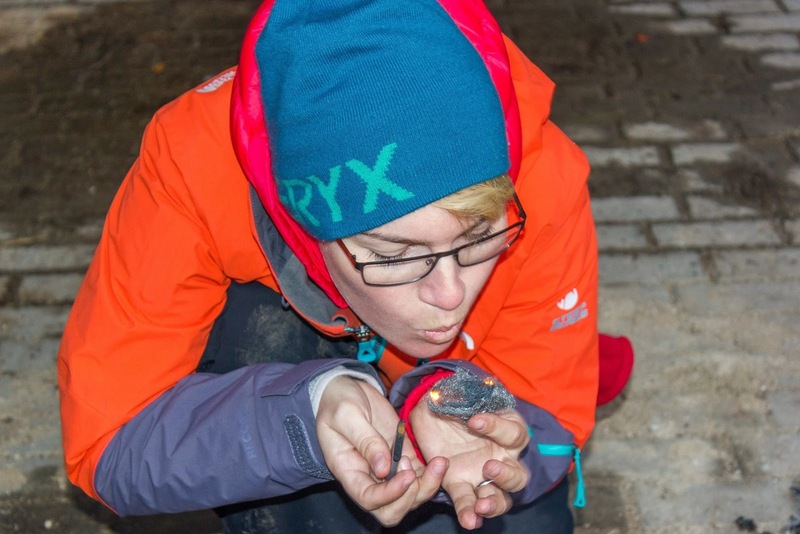 Den här listan är såklart gjord för fjällen, pför en liten vandring i skogen behövs det ju inte alltid att gå med ryggsäcken. En termos tycker jag är jättebra, så kan man även ha varm mat (varma koppen, frystorkad) utan att ta med gasköket. Ska du gå på tur under sommaren? Själv 'samlar' jag alla Sveriges nationalparker, men har hittills bara besökt 7 av 29. Näst kommer Muddus, Store Mosse och Sånfjället.